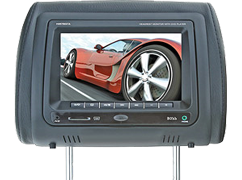 has high-quality resolution monitor screen and built-in dual channel IR. Also come with a wireless remote and interchangeable pillow covers for total convenient set up! Various colors are available for our universal headrest monitors such as Black, Tan and Grey for its pillow covers. Made from one of the world's highly respected car audio and mobile video manufacturer with precise mechanical engineering components to deliver high-quality performance. Available at amazing low price point so you can have more to spare for your other mobile audio and video essentials!